Join me at 10 a.m. on Wednesday for a chat discussing the Detroit Lions as they prepare to play the Cowboys in a wild-card game on Sunday at Dallas. Plenty to discuss including the status of Ndamukong Suh and the problems with the offense. Join in, it's always fun. ALLEN PARK — Ndamukong Suh has been suspended for one game per a report from ESPN’s Chris Mortensen. Suh stepped twice on the left leg of Packers quarterback Aaron Rodgers late in Sunday’s 30-20 loss to the Packers. The first step with Suh’s right foot appeared accidental. Then the next step with his left foot appeared to be purposeful. 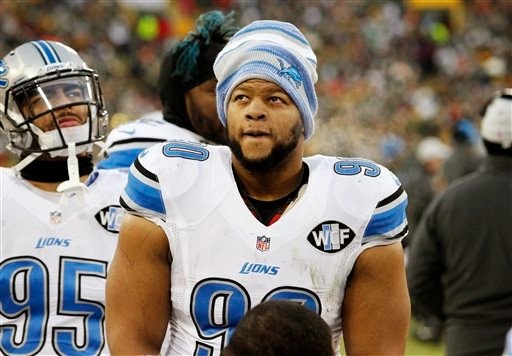 Suh can appeal the fine on Tuesday in an expedited process with an answer by Wednesday. This likely means the Lions will be playing without Suh and Nick Fairley in Sunday’s playoff game against the Cowboys at Dallas. 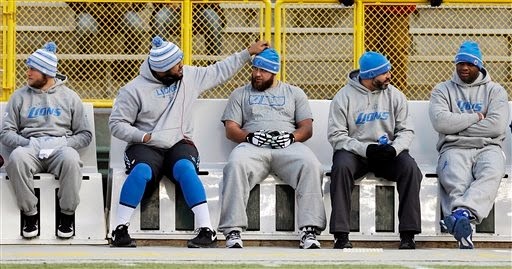 Earlier Monday, coach Jim Caldwell said it’d be a miracle if Fairley could play Sunday. Fairley has been out with a knee injury since Oct. 26. Look for C.J. Mosley, who has started eight games for Fairley, to start along with Andre Fluellen or Jason Jones. Suh’s history of discipline issues no doubt played into the decision to suspend him. In 2011 he was suspended for two games for stomping on Green Bay’s Evan Dietrich-Smith. Last year he was fined $100,000 for an illegal low block on Vikings’ center John Sullivan. He has a long history of fines dating back to his rookie season in 2010. Suh will be a free agent in March. This suspension could certainly be costly. It will likely be taken into consideration by teams who are interested. If he's paid big money, teams will want him to be available on Sundays. Caldwell said he talked with Ndamukong Suh about stepping on Rodgers, but wouldn’t reveal the content of the conversation. “I did have a chance to look at it, we looked at it closely. I had a chance to visit with (Suh) and all those kinds of things which you would anticipate and expect,’’ Caldwell said. Caldwell wouldn’t share his thoughts on the matter prior to the announcement of the suspension. ALLEN PARK — Lions coach Jim Caldwell said it would take a miracle for Nick Fairley to be able to play on Sunday at Dallas. “It’d be a miracle, I can’t rule it out but it’d be a miracle,’’ Caldwell said on Monday. Also, said he was uncertain about status of right guard Larry Warford who was unable to finish Sunday’s game with a knee injury. “Not certain, not ruled out at this stage. Not certain yet we’ll have to see,’’ Caldwell said. The Lions, who lost 30-20 to the Packers on Sunday, play the Cowboys in a wild-card game at 4:40 p.m. on Sunday in Dallas. The Detroit Lions’ defense is playing well enough to win a playoff game. Special teams has to tighten up. They allowed a punt return for a touchdown early Sunday. Not acceptable. Then there’s the offense. Not sure if it’s Matthew Stafford or the play-calling. Or the offensive line protection or the receivers. The run game has come around in the past few weeks. Where do you start evaluating Stafford? A week ago, Lions coach Jim Caldwell defended his young quarterback. And Caldwell added that he thought much of the criticism came from the local media. That said, Stafford needs to play better than he did in the 30-20 loss at Green Bay if the Lions are to have a chance at beating the Cowboys on Sunday in Dallas (kickoff 4:40 p.m.). FOX had a stat during Sunday’s game that said Stafford is 0-16 on the road against teams with winning records. The stat should read Stafford and the Lions. It’s tough to evaluate Stafford because he’s not a one-man band. Receivers need to get open, run the right routes and catch the ball when it’s close. Sunday he was playing with rookies at center and right tackle. For most of the game Garrett Reynolds at right guard after Larry Warford was injured. It's remarkable he was only sacked twice. He didn’t have much time to get the ball out. He does seem better at deciding when to throw the ball away. While tight end Eric Ebron is improving, he still plays like a rookie at times. Stafford was 20 of 41 for 217 yards, three touchdowns and zero interceptions. It’s key that he didn’t have a turnover. But he threw eight straight incompletions. His fault, the receivers’ fault? Let’s blame all parties. Caldwell's message after the game was that playoffs is an all new season. We'll see if the offense can take a step in the right direction. Another NFL Sunday, another Lions’ controversy. Late in Sunday’s 30-20 loss to the Packers at Green Bay, quarterback Aaron Rodgers was down on the field after throwing a pass. Ndamukong Suh took a step backward with his right foot which landed on Rodgers’ left leg, the site of his calf injury. Instead of getting out of the way, Suh then stepped on Rodgers’ left leg with his left foot. Rodgers looked steamed and tried to push Suh away. No penalty was called. On NBC Sunday night, Sports Illustrated’s Peter King said the league will review the play on Monday. King referred to it as a “stomp” which seems harsh. Suh faces a possible fine. Seems unlikely he would be suspended for a playoff game. Packers coach Mike McCarthy called Suh’s moves “ridiculous” in the post-game press conference. Suh did not talk to the media after the game. The Lions’ defensive tackle has been fined eight times by the NFL in his career. He was suspended for two games in 2011 for stomping on Green Bay’s Evan Dietrich-Smith. Lions center Dominic Raiola was suspended for Sunday’s game for stomping on Chicago’s Ego Ferguson the previous game. He will be reinstated on Monday. Jim Caldwell said every team he’s coached has had some kind of ugly streak, some string that had to be snapped. Some demon that had to be exorcised. Of course, the Detroit Lions are no different. While Caldwell and his roster aren’t responsible for these streaks, it’s up to them to make them go away. 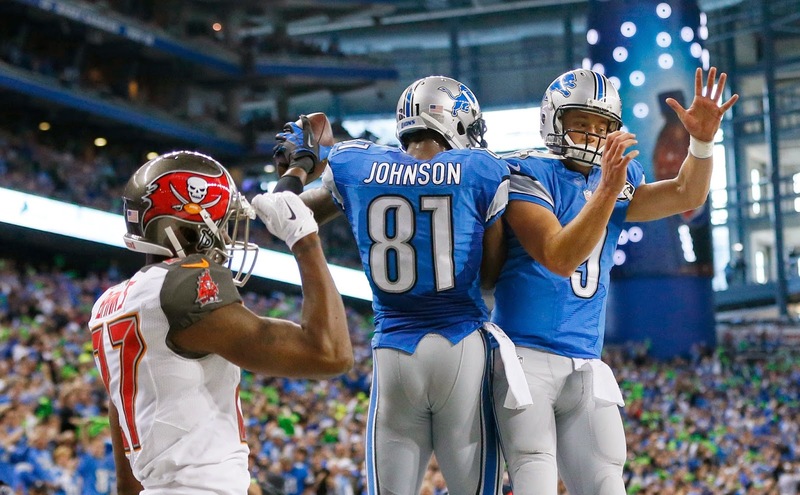 Led by Caldwell, the Lions have the opportunity to break three really ugly streaks. With a win over the Packers at Green Bay today, they can snap two of them. 2. The Lions could win their first division title since 1993. It was the NFC Central then, not the NFC North. The final two regular season games that year were at Chicago, then against the Packers at the Silverdome. The Lions won both. Then Detroit hosted a playoff game against the Packers again and lost 28-24. This all would be moot point if Alex Henery hadn’t missed three field goals in the home 17-14 loss to the Bills. But it happened, so onward. 3. In 1991 the Lions won the first playoff game since 1957 when they won the NFL World Championship. That 1991 post-season win still stands as the last one. It was a 38-6 win over Dallas at the Silverdome. After the 2011 season, the Lions lost 45-28 to the Saints at New Orleans (see photo) — that was Detroit’s seventh straight playoff loss. A win today, would give the Lions a first-round bye and a home playoff game. That would greatly enhance the Lions’ chances to win a playoff game again. It’s easier to win a playoff game at home as a No. 2 seed rather than on the road as the No. 6 seed. Dominic Raiola’s one-game suspension was upheld after an NFL appeal hearing on Tuesday. 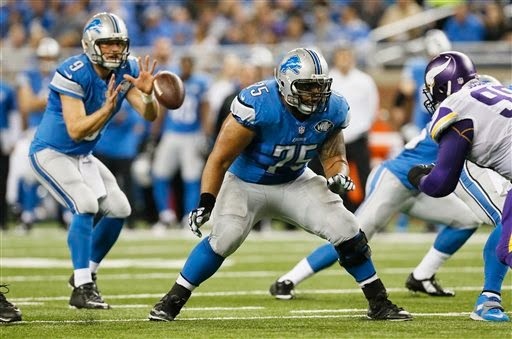 The veteran Detroit Lions center will miss Sunday’s key game at Green Bay, snapping his 99-game starting streak. Raiola stomped on Chicago’s Ego Ferguson in the win over the Bears on Sunday. He was not penalized for the play. Rookie Travis Swanson, who started four games this season for an injured Larry Warford at right guard, will likely start for Raiola. Packers coach Mike McCarthy said with Raiola out, he’ll be watching the way the line interacts with each other. McCarthy said the Packers are familiar with Swanson who they liked coming out of the draft. The Lions drafted him in the third round out of Arkansas. “He’s a good football player. His size, he looks like he’s definitely in control. I don’t think the scheme or the load of running a multiple personnel offense, I think he definitely fits with what they’re trying to do,’’ McCarthy said. “I think the thing you have to really look at is and that’s what we have, we’ve done it. You look at the number of snaps he’s played in their OT packages and the fact that your back-up center is out there playing the tight end position, I think says a lot about him,’’ McCarthy added. Coach Jim Caldwell said on Monday that he believed Raiola when he said it was inadvertent, although after watching film Caldwell could see both sides. The Packers practiced on Tuesday and will take Christmas day off. The Lions had Tuesday off which is the normal routine and will practice Thursday in the late afternoon. Coach Jim Caldwell met with the leadership council before deciding whether to practice on Christmas day. Kickoff is 4:25 p.m. on Sunday. Let it go, please let it go. We are not frozen in time. What resemblance does this bunch have to teams of the recent past? They play close games, but they mostly win them. They are 7-1 at home and 4-3 on the road in the first season under coach Jim Caldwell. Just because a game is close, doesn’t make the Lions failures. In the NFL, it’s not how you win but how many you win. Maybe you’ve noticed that NFL games are often about the unexpected. Did you think the woebegone Redskins would upset the Eagles on Saturday night? The New England Patriots went down to the wire with the Jets on Sunday. Were you expecting that? 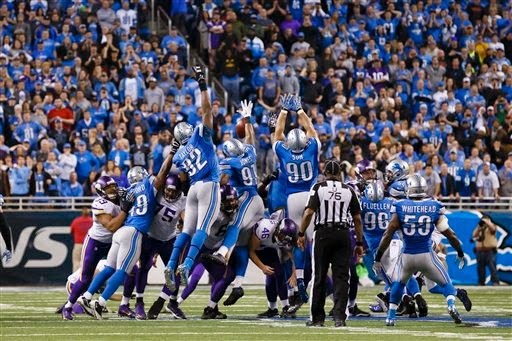 Not saying these Lions are the best or even that they will win a playoff game. There’s just no denying they are different. 1. They are 11-4. First time the Lions have won 11 games since 1991 when they finished 12-4. 2. They’ve clinched a playoff berth for second time since 1999. With a win on Sunday at Green Bay they could win their first division title since 1993. 3. The defense came out solid in week one and has improved. There is no such thing as a perfect defense in the NFL, but this group is formidable. 4. Matthew Stafford gets dumped on every week. No, he’s not perfect. He’s too inconsistent. But he makes smarter decisions now and there’s nowhere he’d rather be than leading a fourth-quarter comeback. He’s strong, he’s got guts and he’s matured in his six NFL seasons. 5. 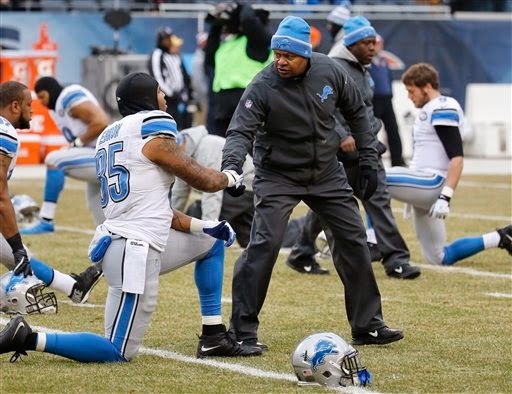 Jim Caldwell is not like other Lions coaches. He’s won two Super Bowl rings and he brought the Colts to the Super Bowl in his first season as a head coach. He’s changed the attitude of the team. He respects them, treats them like men and, in turn, they respect him and, from all accounts, love playing for him. Why wouldn’t they? He’s got them believing in themselves and playing with confidence. The Lions are not an elite NFL team, that takes years. But they are not the same as they have been in the past. They are not. So please, please enjoy what you see. Did you expect an 11-win season? Not many did. And, in fact, it could be 12 wins. These Lions are different. Admit it. I beg of you, let it go. 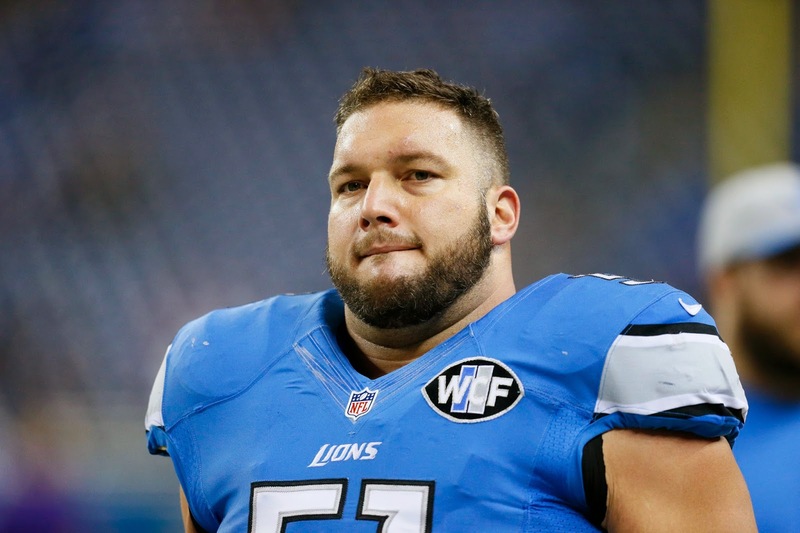 ALLEN PARK >> Lions center Dominic Raiola has been suspended for one game by the NFL for stepping on Bears Ego Ferguson. Raiola will miss Sunday’s game at the Green Bay Packers that will determine the winner of the NFC North. He will have an opportunity to appeal with an immediate answer. Raiola will not be allowed to attend team meetings and functions until he is reinstated on Dec. 29. He also can not attend or watch practices; appear at the club’s facility; attend press conferences; appear at the team’s Dec. 28 game, or have contact with any club personnel except to arrange off-site medical treatment. Earlier on Monday, coach Jim Caldwell said that he believes Raiola when he said stepping on Bears’ Ego Ferguson was inadvertent in Sunday’s win at Chicago. The Detroit Lions coach addressed the situation in his press conference. “Obviously I took a good look at it both the coach’s copy and also the television copy as well. I believe what Dom told me that it was inadvertent, but I can see why —obviously it’s being reviewed by the league and everybody is taking a good look at it — you can also see the other side as well,’’ Caldwell said. Raiola told reporters after the game that he had apologized to Ferguson at the end of the game, told him it was unintentional and the two shook hands. Ferguson misses a few snaps but was able to complete the game. who was fined $10,000 after the New England game on Nov. 23 for unnecessary roughness for striking defensive lineman Zach Moore in the back of the head. Caldwell said they will adjust in case of a suspension. “Just like we’ve done the rest of the year, we’ve had significant injuries, significant setbacks and the guys find a way,’’ Caldwell said. Rookie Travis Swanson, who started four games at right guard when Larry Warford was injured, could fill in for the 35-year-old Raiola. Another possibility would be Rodney Austin who played in one game in 2013. He was brought up from the practice squad on Nov. 25. “It’s one of those things where obviously you can’t replace experience but nevertheless youth and vitality will be able to offset some of that — you certainly can’t offset all of that,’’ Caldwell said. Raiola has started 203 games for the Lions. Today on the NFL Network’s “The Aftermath” former Lions wide receiver and current network analyst Nate Burleson shared his thoughts on Dominic Raiola and Sunday’s incident in the win at the Chicago Bears. Raiola, who turns 36 on Dec. 30, has played 14 seasons with the Detroit Lions and never beat the Packers in Wisconsin. Initial reports say he’ll be suspended for one game, but nothing is official yet. No startling news for the Lions on active players against the Bears at Soldier Field today. Nick Fairley remains out and hasn’t practiced since his knee injury on Oct. 26. As expected Cornelius Lucas will start at right tackle in place of LaAdrian Waddle who was placed on injured reserve this week. Cornerback Josh Thomas, who practiced for the first time on Thursday, after he was claimed off waivers from the Jets, is active. Expect to see him on special teams. Other Lions inactives: Wide receiver Ryan Broyles, cornerback Mohammed Seisay, guard Rodney Austin, defensive end Larry Webster, defensive tackle Caraun Reid and quarterback Kellen Moore. Bears inactives include right guard Kyle Long (hip). Long vs. Ndamukong Suh was expected to be a key matchup in the game. Also: DT Will Sutton, kicker Robbie Gould, QB David Fales, S Chris Conte, CB Terrance Mitchell and DE Trevor Scott. The Lions are in the playoffs, thanks to the Eagles loss to the Redskins on Saturday night. Still today’s game against the Chicago Bears is important in the quest to win the NFC North. Detroit roasted the Bears on Thanksgiving, today they’ll go for the sweep. 1. Jimmy Clausen, who hasn’t started a game since 2010, should be easy to rattle especially with the Detroit Lions’ defensive line. They should go after him early and often to get him off his game. 2. Don’t take Clausen lightly. Yes his last start was in 2010 when he was 1-9 for the Carolina Panthers. Still, there’s a reason the Bears are going with him over Jay Cutler. 3. Stop the run. With Clausen in at quarterback, expect plenty of rushing attempts from Matt Forte and the rest. Make the Bears one-dimensional because chances are Clausen is not going to throw for 480 yards. 4. The weather forecast is for 38 degrees and sunny -— practically spring in Chicago. So the Lions’ passing game should be operational. 5. Get the ball to Calvin Johnson he had 146 receiving yards and two touchdowns the last time these two teams met on Thanksgiving. Will the Bears change up their coverage? You would think, but then the Lions will just have to figure it out. ALLEN PARK — Lions defensive tackle C.J. Mosley, who was added late to Wednesday’s injury report, did not practice today (Thursday) because he's a new dad. Also left guard Rob Sims didn’t practice because he was under the weather. A flu bug has gone through the locker room since last week. Defensive end George Johnson, who missed on Wednesday with an illness, returned to work on Thursday. New cornerback Josh Thomas, who was claimed off waivers from the Jets, was at work wearing No. 24. Nick Fairley (knee) also did not practice. The Lions practiced in outdoor temps of 31 degrees in preparation for the game at Chicago on Sunday. The forecast for the Windy City is 38 and sunny. 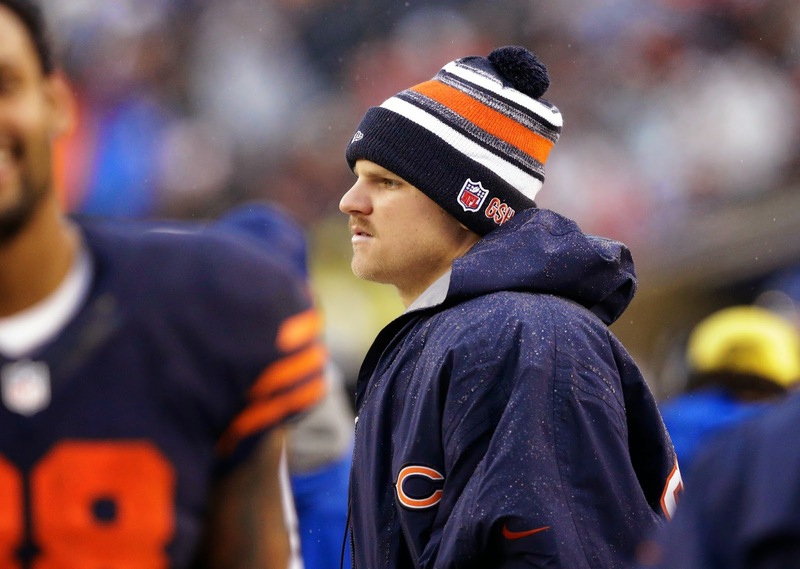 ALLEN PARK — It was adjustment time when the Lions coaching staff heard early Wednesday night that quarterback Jimmy Clausen would be starting for the Bears instead of Jay Cutler on Sunday in Chicago. Clausen played in three preseason games for the Bears with two touchdowns and one interception in limited play. He’s played garbage time — the Bears were too far behind for a comeback — in three regular season games and was 3 of 9 passing for 42 yards and a 49.3 quarterback rating. Cutler was benched amid a host of problems including the fact he’s thrown 18 interceptions and the Bears are 5-9. The Lions need a win on Sunday to clinch a playoff berth. Caldwell said the Lions will not take Clausen lightly. 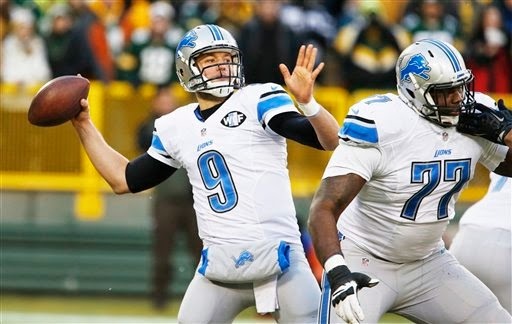 The Lions have lost games to two backup quarterbacks this season — Cardinals’ Drew Stanton and Buffalo’s Kyle Orton. Prior to this season Clausen had not played for three seasons while with the Carolina Panthers. As a rookie in 2010 he started 10 games for the Panthers going 1-9. Join me at 3 p.m. on Thursday for a live chat discussing the Detroit Lions as they prepare to face the Chicago Bears on Sunday at Soldier Field. Quarterback Jay Cutler has been benched in favor of Jimmy Clausen who is 1-9 as an NFL starter. Plenty to discuss. It’s Plan B for the Lions who won’t have to figure out how to stop quarterback Jay Cutler on Sunday. 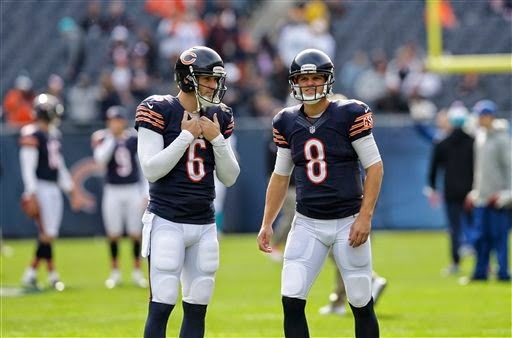 According to ESPN’s Adam Schefter, the Chicago Bears (5-9) will bench Cutler in favor of Jimmy Clausen when the division rivals meet at Soldier Field. The Lions (10-4) can clinch a playoff spot with a win. So far this season, Cutler has 28 touchdown passes and 18 interceptions. Two of those picks came in the Thanksgiving loss to the Lions at Ford Field. Clausen has completed three of nine attempts in garbage time in three games this season where the Bears didn’t have a chance for a comeback. In 2011, 2012 and 2013 Clausen played for the Carolina Panthers, but was not active for a game. He was 1-9 as a rookie starter for the Panthers who drafted him in the second round out of Notre Dame. He threw three touchdowns against nine interceptions and lost two of his nine fumbles. Still, the Lions cannot take Clausen lightly. In the final game of the 2011 season, the Lions played the Packers who had Matt Flynn at quarterback instead of Aaron Rodgers. Easy win? Not so much. Flynn threw for 480 yards and six touchdowns in the Packers’ 45-41 win at Green Bay. 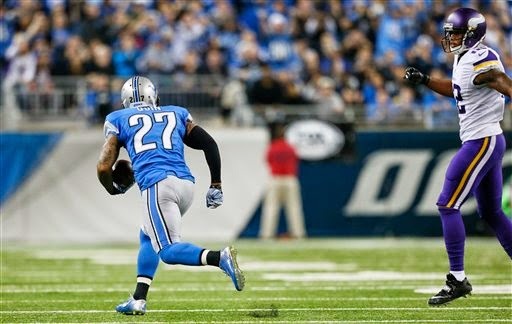 ALLEN PARK — Detroit Lions veteran safety Glover Quin has been named NFC defensive player of the week. It was Quin’s interception of Vikings quarterback Teddy Bridgewater late in the second quarter on Sunday that turned the game around. The Lions had been behind 14-0 at that point. They turned it around and won 16-14. Quin is tied for the lead league with six interceptions. He has one in each of the last three games. After watching the Chicago Bears loss on Monday night, the Detroit Lions should not have a problem getting a win on Sunday at Soldier Field. The Bears (5-9) were much worse than the 31-15 score indicated. Anything can happen, but the Bears have a day less to prepare and look dysfunctional. The Lions (10-4) have opened as 4.5-point favorites. Detroit is currently in first place in the NFC North with a 10-4 record that is identical to the Packers. That Week 3 win over Green Bay at Ford Field was huge. — Detroit clinches NFC North with a win and a Packers loss. — Detroit clinches a first-round bye with a win, a Packers loss and a Cowboys loss. — Detroit clinches a playoff spot with a win or an Eagles loss. The Packers play at Tampa Bay (2-12), while the Cowboys (10-4) host the Colts (10-4). The Eagles (9-5) are at the Redskins (3-11). 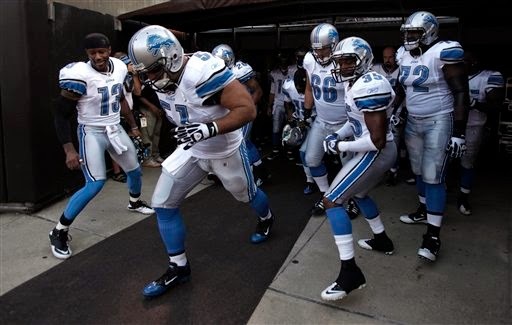 The Lions last went to the playoffs in 2011 and clinched the wild-card berth in Week 16.